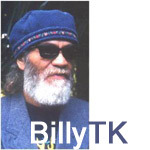 Billy TK is a Kiwi cultural icon, an intense and exciting guitarist who melded contemporary blues-rock with flowing progressive Pacific rhythms when many Maori musicians were still considered part of the showband heritage. He has a strong collection of original songs, often covered by other musicians, but the only albums he’s released have been with Human Instinct and a rare release with his post-Instinct unit Te Whare Mana (Powerhouse) only available in the UK and Germany. At its height Powerhouse played alongside Split Enz and supported John Mayall, Sonny Terry and Brownie McGee, UB40, Joe Satriani and the Neville Brothers. In April 1996 Billy was invited to perform a “walk on” with his hero Carlos Santana at an Auckland concert. He expected to trade a few licks but was surprised when Santana encouraging him to take all the solos on his version of Bob Marley’s Exodus. In recent years he’s worked with several bands including Dunedin-based Flying Nun band King Loser, who he recorded an album with. He also recorded with hip hop artist DLT. Another cross-over project has him currently working with a film crew who went to India and recorded some Indian mystics along the Ganges river. They’ve asked Billy to play with the pieces as they meld the recordings into something for the contemporary market. As well as occasional performances with Human Instinct 2002, Billy has been collaborating with Blerta founding member Tony Littlejohn on a CD of his original songs expected to be released early in 2003 including the tracks Prisoner, Winning and Destiny. Billy Te Kahika (Billy T K) began experimenting with feedback and developing his own electronic pedals in 1966 with his Palmerston North-based band The Sinners. As soon as the music of Jimi Hendrix hit the airwaves he devoured the sounds, rapidly learning the contents of each successive album. After The Sinners folded he was asked to join singer and stand-up drummer Maurice Greer who had just returned from two years in the UK playing alongside the greats of the British rock scene with his unit Human Instinct. The trio, through a succession of bass players including Peter Barton, Larry Waide and Neil Edwards, quickly became one of the loudest, most highly paid and respected rock units in the country. They worked most nights of the week and recorded three albums Burning Up Years, Stoned Guitar and Pinz In It which became underground classics catapulting the band to legendary status. In the late 1980s the German-based Little Wing label re-released a box set of the LPs. In the liner notes the label applauded Billy T K as “technically and melodically … one of the best and most innovative guitarists of the 70s” … the (first) box set ensuring “Billy T K his place beside Hendrix, Beck and Clapton”. Billy left Human Instinct after their 1972 tour of Australia and began recruiting members for his own unit Powerhouse which was to play more fluid, contemporary South Pacific rhythms with strong Santana influences. The band featured up to 10 members, maintained residencies in Wellington and Palmerston North and played the Ngaruawahia music festival just ahead of Black Sabbath. These days Billy still performs the Hendrix-Cream styled music he’s most noted for, as well as original flowing, rhythmic guitar anthems which he has become known for. At the Amplifier site, for the first time ever you can now hear the first of a series of demos Billy T K is sorting through to find the best material for a compilation CD which captures the best of those years of performing and playing with some of the nations best rock and ethnic players.